As much I like all the blogs and articles, there's always room on my bookshelf for some top quality programming books. There are some great books due out this year. Here is my rundown of books that I'm looking forward to owning. It's no exaggeration to say that I've been waiting years for this book to be published, and thankfully on February 19th it will be available. I attended Jeff McAffer's Best Practices in OSGi talk at Eclipse Summit Europe in 2008, where the book was first mentioned. As a Java developer, this book should be a useful introduction into creating modular bundles in OSGi. But as an Eclipse developer, this book will be an essential guide to writing high quality, well-designed, plug-ins. I really like the "97 Things" idea. It's never too late to learn new things, and you're bound to find something new among the 97 tips from across the development industry. The complete list is available on the O'Reilly site, for those who can't wait for the print edition. I'm a pure Java developer, but I can't resist the iPhone. It's probably the most complete device I've ever used, and I really want to get into programming for it. I'm reading through another iPhone development book at the moment, but with the author being the same guy that wrote Twitterific, it would be crazy not to invest in just one more book. I'm definitely looking forward to reading the insights into iPhone development. Now and again I need to use SQL, but my knowledge is fairly limited, I'm definitely no expert. I'm sure some of the SQL I've written in the past is inefficient. This book claims to illustrate some best practices and help the casual SQL developer to get around the problems that can pop up. 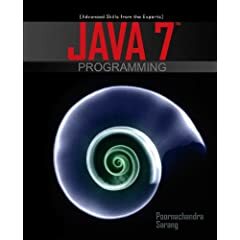 Is it a bit Hopefully, with the release of Java 7 this year, I'll get a decent book to give me a guide through the new language features. There appears to be a few in the works already, but I'm not sure if their release dates are precise. Still, this one looks like it takes developers familiar with Java through the updates for Java 7. The other essential Eclipse related book will be this RCP book written by Chris Aniszczyk. The latest version of the book looks like it will cover all you need to get your rich client application going, including an overview on OSGi and details on how to use p2. I'm sure I've missed some great books that are on the way this year. Why not leave a comment and let us know what books you're looking forward in 2010?